For a few years, I fed the Microship project with speaking gigs… sometimes with the help of Keynote Speakers bureau. This was one that they found me, and it was unusual… 11 half-hour talks in a booth on the show floor. That was quite relaxing compared to a standard keynote, and led to lots of banter with the crowd. I remember joking about my “bypass methodologies,” including the OmniTRACS terminal that allowed network communications without going through the phone system. I would quip that everything on a bicycle has to have multiple functions to reduce excess weight, then mention that my salad bowl doubles as a fine cover for my satellite earth station. The documents on this page include the program listing as well as a lively feature in the show daily of Tuesday, April 6. TEXPO 93 is featuring one (if its most unique communications-oriented exhibits to date. 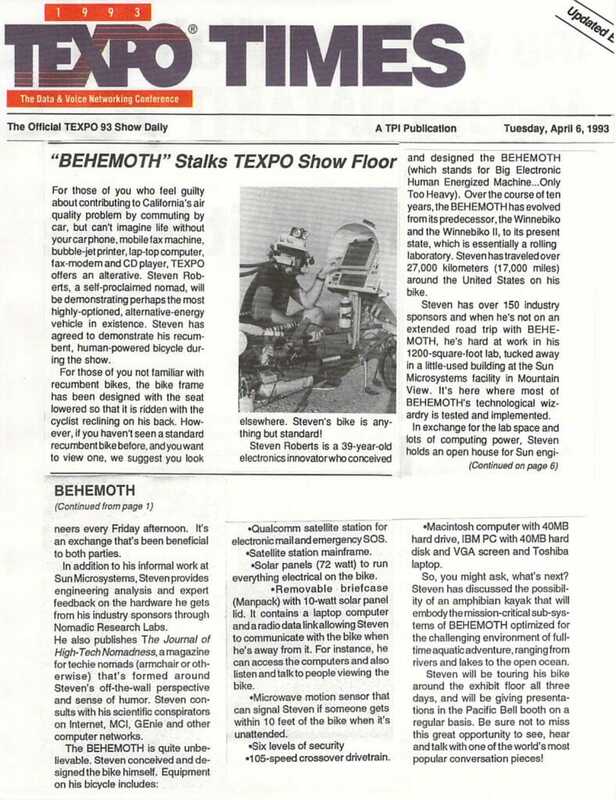 The showcased invention was named the “BEHEMOTH” by its creator, Steven Roberts, anelectronics innovator from Sun Microsystems. What is the BEHEMOTH? While best described as the most highly optioned, alternative-energy vehicle in existence, the BEHEMOTH is a highly modified recumbent, human-powered bicycle. The typical recumbent bike is designed to be operated with the cyclist reclining on his back. The BEHEMOTH, however, is anything but typical. During the 3 show days, Steven Roberts will be giving presentations on the BEHEMOTH in the Pacific Bell booth and will also be touring the TEXPO floor. For those of you who feel guilty about contributing to California’s air quality problem by commuting by car, but can’t imagine life without your car phone, mobile fax machine, bubble-jet printer, lap-top computer, fax-modem and CD player, TEXPO offers an alternative. Steven Roberts, a self-proclaimed nomad, will be demonstrating perhaps the most highly-optioned, alternative-energy vehicle in existence. Steven has agreed to demonstrate his recumbent, human-powered bicycle during the show. For those of you not familiar with recumbent bikes, the bike frame has been designed with the seat lowered so that it is ridden with the cyclist reclining on his back. However, if you haven’t seen a standard recumbent bike before, and you want to view one, we suggest you look elsewhere. Steven’s bike is any thing but standard! Steven Roberts is a 39-year-old electronics innovator who conceived and designed the BEHEMOTH (which stands for Big Electronic Human Energized Machine… Only Too Heavy). Over the course of ten years, the BEHEMOTH has evolved from its predecessor, the Winnebiko and the Winnebiko II, to its present state, which is essentially a rolling laboratory. Steven has traveled over 27,000 kilometers (17,000 miles) around the United States on his bike. Steven has over 150 industry sponsors and when he’s not on an extended road trip with BEHEMOTH, he’s hard at work in his 1200-square-foot lab, tucked away in a little-used building at the Sun Microsystems facility in Mountain View. It’s here where most of BEHEMOTH’s technological wizardry is tested and implemented. In exchange for the lab space and lots of computing power, Steven holds an open house for Sun engineers every Friday afternoon. It’s an exchange that’s been beneficial to both parties. In addition to his informal work at Sun Microsystems, Steven provides engineering analysis and expert feedback on the hardware he gets from his industry sponsors through Nomadic Research Labs. He also publishes The Journal of High-Tech Nomadness, a magazine for techie nomads (armchair or otherwise) that’s formed around Steven’s off-the-wall perspective and sense of humor. Steven consults with his scientific conspirators on Internet, MCI, GEnie and other computer networks. Qualcomm satellite station for electronic mail and emergency SOS. Solar panels (72 watt) to run everything electrical on the bike. Removable briefcase (Manpack) with 10-watt solar panel lid. It contains a laptop computer and a radio data link allowing Steven to communicate with the bike when he’s away from it. For instance, he can access the computers and also listen and talk to people viewing the bike. Microwave motion sensor that can signal Steven if someone gets within 10 feet of the bike when it’s unattended. Macintosh computer with 40MB hard drive, IBM PC with 40MB hard disk and VGA screen and Toshiba laptop. So, you might ask, what’s next? Steven has discussed the possibility of an amphibian kayak that will embody the mission-critical sub-systems of BEHEMOTH optimized for the challenging environment of full-time aquatic adventure, ranging from rivers and lakes to the open ocean. Steven will be touring his bike around the exhibit floor all three days, and will be giving presentations in the Pacific Bell booth on a regular basis. Be sure not to miss this great opportunity to see, hear and talk with one of the world’s most popular conversation pieces!